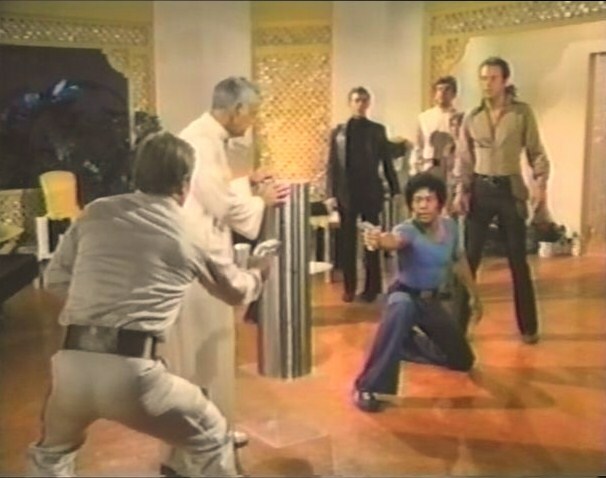 ← Saturday Morning TV Blogging: Jason of Star Command: "Beyond the Stars!" In this tenth story, our wayward travelers encounter a crashed spaceship in the forest. They encounter two men, York (Richard Jaeckel) and Tye (Nicholas Hammond), who claim to be co-pilots of the craft, but are actually prisoners who have escaped from that vessel…a penal transport. Before long, Varian and the others, along with York and Tye, encounter a race of peaceful aliens, led by Rayat (Lew Ayres). Although I’ve watched it several times, “The Innocent Prey” has never really worked for me as a Fantastic Journey episode. It seems strangely disconnected from the rest of the series in some peculiar way, as though it is flying entirely on automatic pilot. Perhaps everybody involved with the program knew the show had been canceled when this episode was made.. Or perhaps it is that this episode, more than any of the others, feels like it could have been produced on Logan’s Run (1977), The Starlost (1973), or even Planet of the Apes (1974). I don’t know, but it just feels…undistinguished. 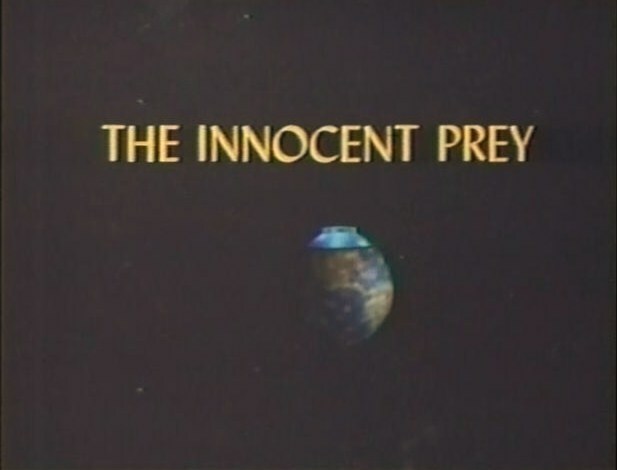 Unfortunately, precious little happens in “The Innocent Prey” terms of character development, and the large and distinguished guest cast — Jaeckel, Hammond, Ayres, Ladd and Gerald McRaney as a prison guard — only seems to subtract from Martin, Eisenmann, McDowall and Franklin. And at this point, I’d rather see more of the regulars than another “rote” adventure in which a pacifist society must be saved from itself. All in all, this episode feels very much “by-the-numbers,” though perhaps I feel this way simply because I would have preferred a stronger final episode, and certainly one that featured some sense of closure for the characters I have grown to appreciate. Directed by Vincent McEveety, “The Innocent Prey” opens with stock footage of the alien spaceship from The Invaders (1967 – 1968) and features Lew Ayres in a role well-in-keeping with his real life philosophy of pacifism. In fact, Ayres has portrayed pacifists in sci-fi TV and film history more than any actor I can remember. 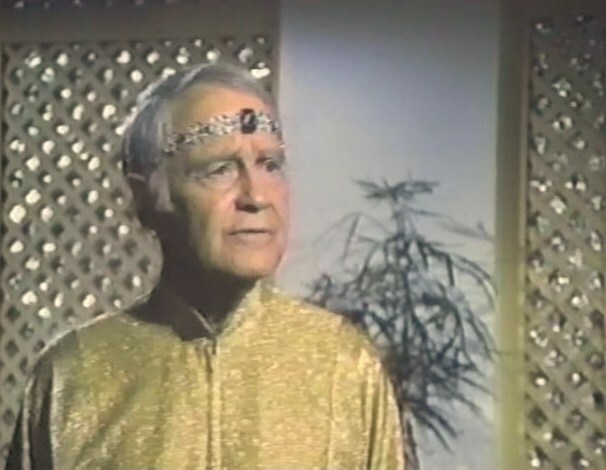 He was the ape, Mandemus, guarding the armory in Battle for the Planet of the Apes (1973), the scientist Elijah Cooper, who hoped to force disarmament and world peace on the nations of the Earth in The Bionic Woman (“Doomsday is Tomorrow”), The Colonies’ misguided President Adar in Battlestar Galactica, and the peaceful Rayat here. In “The Innocent Prey,” Ayres delivers several speeches about harmony and peace, and his people here are so “open” that they don’t even believe in doors. It’s interesting that on cult-tv programming pacifists are often equated with “fools,” ones easily exploited by those with bad intentions I wonder how Ayres squared that perception with his own philosophy. He not only played a pacifist many times, but a man “tricked” and manipulated by evil doers. 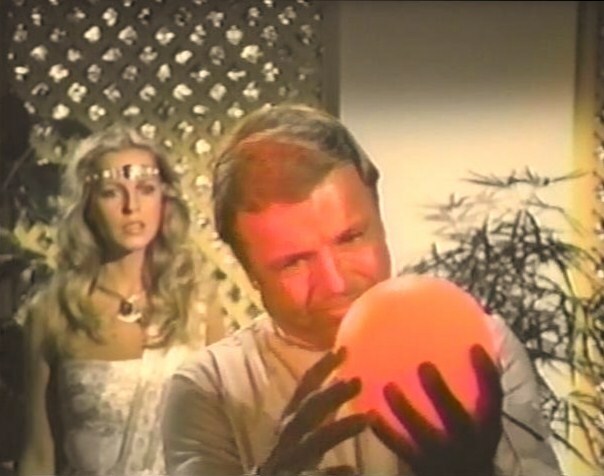 “The Innocent Prey” culminates with the villain, York, touching the mystical orb, and the orb reverting him to a form of “innocence,” as an infant to be raised by Rayat. It’s a memorable ending to an otherwise “meh” episode of The Fantastic Journey, but an entirely unfitting end for the series as a whole. Gazing back at The Fantastic Journey’s catalog, I can see that a few episodes really worked well (“Beyond the Mountain,” “The Funhouse,” “Riddles” and perhaps “An Act of Love”) while the rest mostly seemed to mark time. However, the performances and character interaction makes me want to revisit the show time and again, over the years: Jared Martin as Varian, Ike Eisenmann as Scott, Roddy McDowall as Jonathan Willaway, Carl Franklin as Fred Walters and tragic Katie Saylor as Lianna. The actors really did a marvelous job with these characters, and had terrific chemistry with one another. It’s too bad that so many of the episodes were rather pedestrian in terms of concepts and narratives. These characters deserved better. Next week on Cult TV Blogging, I begin my episode-by-episode retrospective of another short-lived science fiction series Otherworld (1985). It lasted all of eight episodes — two less than The Fantastic Journey (1977). This entry was posted in 1970s, cult tv blogging, The Fantastic Journey. Bookmark the permalink. A nice wrap up of your 'Fantastic Journey' coverage. 'The Innocent Prey' initially seemed more impressive when I first saw it, because of the spacecraft footage in the beginning. I later learned this was just stock-footage from 'The Invaders' (as you noted). This ep does feature quite a cast of 70's actors. Beautiful Cheryl Ladd would soon go on to superstardom! One small note for 70's kids, teenage Ike started the series with a part in the side of his hair. Later, he switched to a part in the middle. In the 70's, the 'cool' kids parted their hair in the middle! Looking forward to your reviews of 'Otherworld'… another, often overlooked series which was probably inspired by 'Fanatstic Journey'.